Download plug-in object code and put it at your plug-ins folder then follow nopCommerce standard plug-in installation procedure to install plug-in. Bundled Discounts plug-in is available under “Promotions” group on local plug-ins page. Once plug-in is installed go to your nopCommerce admin panel, and go to Configuration → Plug-ins → Local plug-ins → Bundled Discounts plug-in. 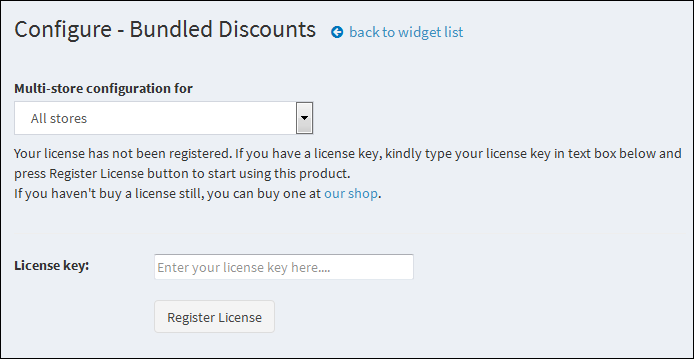 It will ask you to enter your license key as shown in figure below, enter license key which you received on your registered email after purchasing this plug-in from our website.